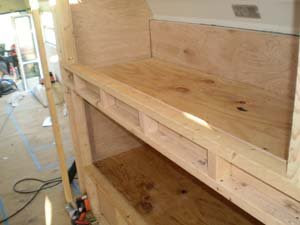 For the most part we finished the bunks today. 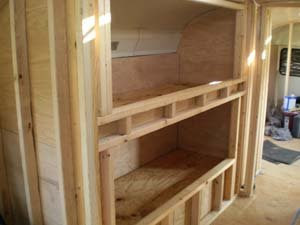 There is still some trim work and paneling to be done but the framing is finished. 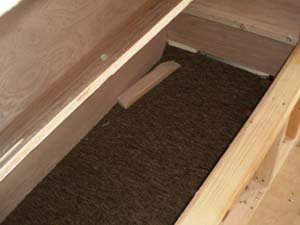 I cut a hole in the ply wood of the bottom bunk because the bunk hinges open to expose a storage area below it. We already carpeted it. 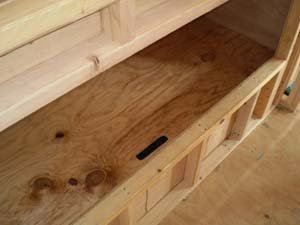 I will probably add 2 or 3 dividers in this area and use it as a place to store things or even keep clothing. Today we also permanently reinstalled the 3 vents that go on the roof. 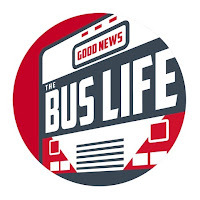 When we got the bus these were leaking a little so I sealed them down with silicone and used roofing screws with the rubber gasket. This should water proof it. We also received the delivery of the Carrier roof mount A/C unit that we got off ebay. I may be able to get that installed on Sunday. We went to Lowe's today and picked up a few more needed items. A couple long drill bit. All this came to around $100.